Today is the last day of my mini hair series. And the Double Waterfall Braid. 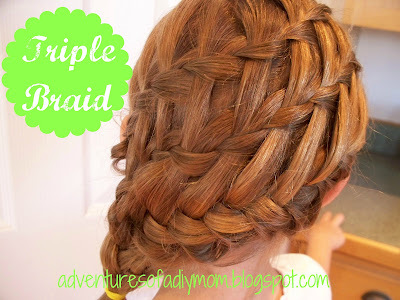 Today I'll show you how I do the Triple Braid. This braid works best on thick hair. In fact, I was showing my sister how to do the Double Braid on her daughter's hair. After I got the first waterfall braid done, my sister made the comment, "good luck getting the rest of her hair in the bottom braid". And that was how the triple braid was born. She was right - her daughter's hair is thicker than anyone I've ever known. I probably could have done a quadruple braid if I wanted. 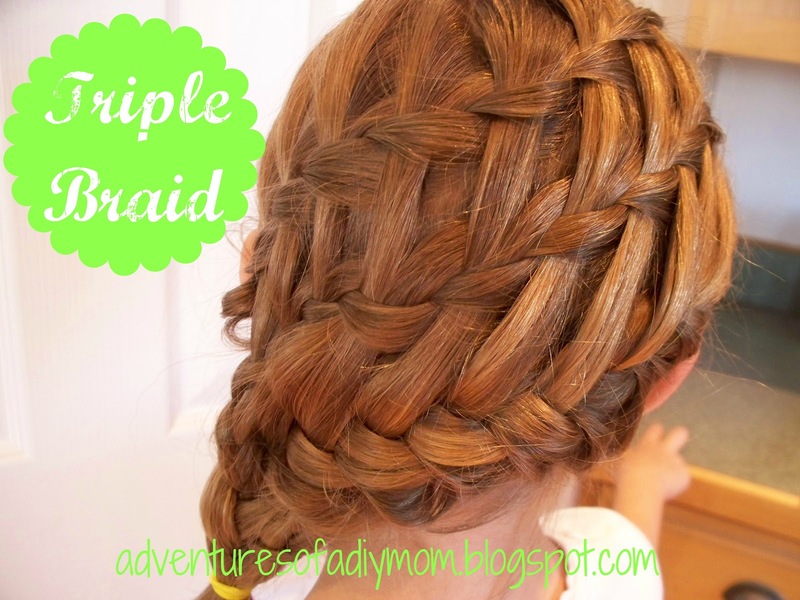 The Triple braid looks complicated, but it's not that hard. 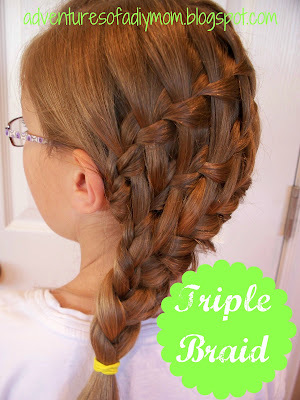 It is a combination of the Double Braid and the Double Waterfall Braid. It might help to review them. 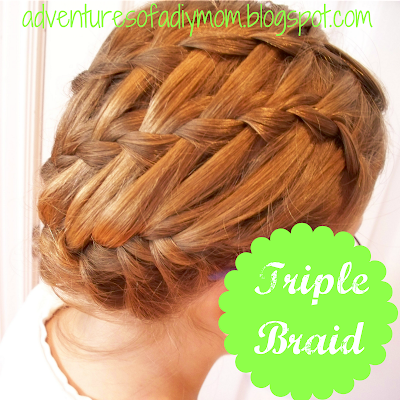 Start out by doing the Double Waterfall Braid. Go here for more details. I braided each waterfall braid all the way to the end of the hair. 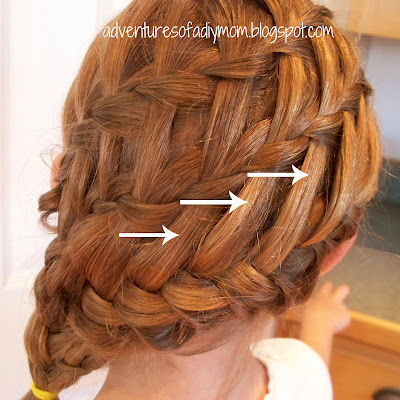 Next, do a french braid right below the second waterfall braid. 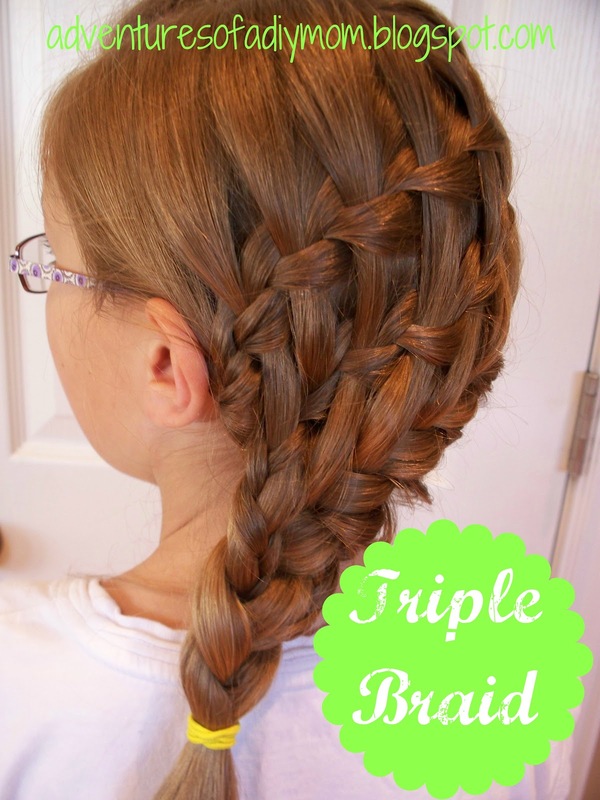 Just like in the double braid, you will want to make sure you just grab the "waterfall" section when you add the top pieces into the braid. When you get to the end, add those braided pieces in and continue braiding down. Doesn't that just look amazing? What did you think of my hair series? I love your blog and all your creative ideas. I'm awarding you the Sunshine Award. 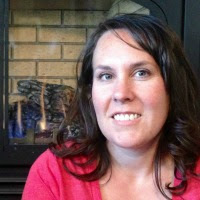 You can read about it here: http://fromoverwhelmedtoorganized.blogspot.ca/2012/07/sunshine-award.html. Congratulations and have a great weekend! Wow. The combined texture of all those braids is incredible - it's like art! Love this! Would love for you to share this at our Kitchen Fun and Crafty Friday link party...just posted it! This looks beautiful! What a great series. Thanks for sharing on Tout It Tuesday! Hope to see you tomorrow. What pretty hair your daughter is blessed with !